Debunking Christianity: Edward Feser Should Be Fired From His Teaching Post! Edward Feser Should Be Fired From His Teaching Post! 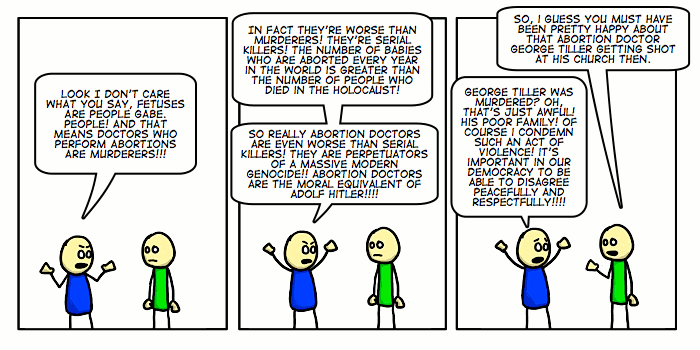 We've heard about the murder of George Tiller, an abortionist doctor. But did you know that in this blog post Edward Feser compares Tiller to Jeffrey Dahmer who killed, dismembered and ate 17 men and boys. Feser claims that "Tiller was almost certainly a more evil man than Dahmer was." No wonder I won't bother reading his book length diatribe against the new atheists, "The Last Superstition: A Refutation of the New Atheism." Feser teaches for Pasadena City College in Pasadena, California which is a community college. I call upon that college to fire him for this highly inflamed rhetoric which will probably bring on more murders of abortion doctors. And I ask others to do likewise. No professor should use such inflammatory rhetoric or be so ignorant about some crucial distinctions. While people wring their hands about whether or not a fertilized egg is a person or not, there just isn't a real convincing debate about late term viable fetuses. They are people, they are innocent people, they are the victims of premeditated murder in abortion. I'd say that puts Tiller on a par with Dahmer. Well I've heard other Christians proclaim Dahmer one of the saved because of his conversion in prison. Amazing how much evil Yahweh/Jesus will allow if one says "only kidding Lord" afterwards. Most Christians these days believe in infant salvation, right? No one believes a miscarried or aborted fetus goes to hell, right? George Tiller is said to have performed over sixty-thousand abortions. Let's say that abortion was illegal and all those babies had been born. How many of them would have been born again? As we all know, a child's religion is often determined by its parents'. Given the fact that these parents were seeking abortions, its doubtful that many of them were Truly Saved Bible Believers with Born Again Hearts and the Holy Spirit dwelling within. So let's assume that many of their children would follow suit. That's over sixty-thousand potenially unsaved souls. Even if you don't accept the sociological argument, you must concede that at least some percentage of those babies would grow up to be unsaved. Did Dr. Tiller do a disservice unto these babies? Heavens no! If we assume infant salvation is true (and why wouldn't it be? William Lane Craig has stated that he believes in infant salvation. If you want to argue that babies are damned, good luck to you), those babies are in heaven right now! No chance of sin, no chance of rejecting Christ, just pure, infinite bliss for eternity. Over sixty-thousand guaranteed saved souls! How many has Ed Feser saved? Me thinks that two-bit Catholic philosophers hardly make the best evangelists. I certainly doubt he had converted over sixty-thousand. George Tiller: Abortionist for Christ. Chris W is this, was the Dr.'s motive to kill these babies to keep them from hell? He says his motives were to "help" women, let's see over 60,000 thousand abortions he performed at $1,000.00 per each abortion equals 60 million dollars. Who helped who? I don't know how much Dr. Tiller charged. Maybe he gave good deals? This is typical, actually, of Christian reaction when a Christian commits a crime in the name of God. What's typical of the Christian? It's always the victim's fault for being an abortion doctor or a homosexual or an atheist or whatever else they disapprove of. I want to make something clear here. Feser does argue against vigilantism, but if this aspect to his argument is rejected then what? Some of the statements here are no better than Feser's. He's an idiot who's right to free speech is protected. He teaches at a state university in one of the most liberal areas in the nation. Now, if he taught at a Christian college, he would likely be fired. Ironic, huh. One of the patients Dr. Tiller operated on was a 9 year old girl who was raped by her step-father. If she brought the baby to full-term it would have ripped her apart and destroyed the baby. Riddle me the "justice" of mandating she bring the baby term when a safe procedure would end the dangerous pregnancy but kill the "viable fetus". Now, how is Dr. Tiller like Dahmer under those circumstances. I'd say arguing for a 9 year being torn asunder when you can save her life would be more like the sadistic mind-set a serial killer enjoys. "I want to make something clear here. Feser does argue against vigilantism, but if this aspect to his argument is rejected then what?" John, this strikes me as obviously absurd. For example, you argue that religious belief can lead to violence. You also believe in religious freedom. However, what if someone rejects the latter? Do you see all the absurdities your line of reasoning here entails? Eric, it's called inflammatory rhetoric. Feser used it. There is no correlation between his first argument and his second, either, especially if one thinks Tiller is killing people just like Dahmer did. What would YOU do if you knew for sure some guy was killing people next door and the police wouldn't do anything about it because the law allowed it? That's the comparison Feser makes, and I find it represensible and unfitting of a person of his stature in the intellectual democratic community. If my argument about religious freedom is rejected there is no one to kill for anything they might potentially do since I don't say religious people do violence, nor do I say they are evil. And there is a correlation to my two arguments. For it's very unlikely in the extreme to think that a person who rejects religion will also reject the 1st Amendment since their ability to express their skepticism depends on it. Feser should be fired, especially because he teaches at a state college which is subsidized by decent democratic minded people. he is an extremist who deserves to be canned. I call on others to contact his college expressing this concern. Private institutions are a different matter. As far as free speech goes, there have been many people fired for expressing chauvinism, racism and homophobia in academia, as sportscasters, and as pundits. In an article for TIME magazine in 1989 called In Praise of Censure, by Garry Will, a case was laid out from the conservative perspective by a conservative for the same things I agree with today. I linked to page three where the money quote is: "It is a distortion to turn "You can express any views" into the proposition "I don't care what views you express." This article for TIME was provoked by some pornographic art that was partially funded by our government. When the government is involved and when we are the government we have a say in what we want our students learning. BTW: About that time (1989) I led a successful boycott against a store that rented X-Rated videos in our small town. I have done extensive work On the issues surrounding the 1st Amendment not only as a doctoral student but also from being a moral crusader in our town. I don't write much about ethics or politics but I think I know quite a bit about these issues. I even participated in debate at the local university with a few community leaders, including a newpaper editor and a professor who were against me. "There is no correlation between his first argument and his second, either, especially if one thinks Tiller is killing people just like Dahmer did." I disagree. As Feser says, "Vigilantism is itself a grave offense against the moral and social order." In other words, we're not simply dealing with two variables (which you and so many of Feser's critics seem to suppose): (1) S is acting immorally, and (2) S's actions aren't recognized as immoral by the state. We also have to consider (3) the danger to the social order of encouraging vigilantism, (4) the controversial nature of the issue (i.e., it's not a 'decided' issue, as Dahmer's murders were; however, this is the *point* of contrasting Tiller with Dahmer, viz. to point out what Feser believes to be the horrific nature of Tiller's acts to a culture that is morally obtuse in this case), (5) our commitment to deciding controversial issues democratically (or, unfortunately sometimes, judically), and so on. (1) Dahmer was an evil man. (2) Tiller was a more evil man than Dahmer was. (3) Dahmer's evil acts were crimes. (4) Tiller's evil acts were not crimes. (5) Dahmer and Tiller were murdered, i.e. killed unlawfully. (6) The unlawful killing of both Dahmer and Tiller was immoral. I see no contradictions whatsoever here. Tiller wasn't an evil man. He was providing medical care to women in need. All the parsing of arguments misses the point. Equating a serial killer with a medical doctor who was performing a highly regulated surgical procedure is just flat out false witness. Hey, isn't that a violation of one of the ten big laws? Eric, like always you demand a contradiction before you will see the plausibility of a connection. Since demanding a contradiction and finding none makes such a viewpoint "safe," that's what you require. I could find these mental gymnastics in several others cases but I won't bother. All you've done it taken us back to square one in my first comment here. Believers will indeed draw the connection, that's why people like Feser should not use such imfalmmatory represensible rhetoric. John, let's suppose that your 'connection' is indeed there. I have a question: How many firings did you call for among the countless professors who called our former president George W. Bush a 'war criminal' who 'stole' two elections and was responsible for the deaths of tens of thousands of innocents? Because, the connection is, you know, just obvious: Bush is a war criminal; he's not legitimately the president; and he's killing tens of thousands of people. Isn't it *obvious* they were calling for someone to assassinate him? *Of course not*. However, by parity of reasoning, this is a conclusion you must accept. I take that to be a damn convincing reductio of your position on Feser's remarks. I can't believe Feser said such a thing. It's despicable. Tiller was a man who offered a service to women (a service many don't like, but blame the women, not the man providing the service!) and was shot dead for doing what his patients wanted. It reminds me of the religious right's campaign against Dr. Jack Kevorkian for providing a service, and help, to people who wanted it. It's not murder, though late term abortions and "mercy killing" are totally different things, but to me, they are similar in that each person is making a choice about their own bodies and self-righteous idiots are trying to force their views on others. I'm conflicted on whether or not Feser should be fired, but I surely think he deserves a hard kick in the nuts! Chuck, John is claiming that by comparing Tiller to Dahmer, Feser is sending a message (whether he intends or not) to 'true believers' to murder late-term abortionists. But if this is the case, then why can't it be claimed that the professors who called W. a fascistic war criminal who stole two elections and was responsible for the deaths of tens of thousands of innocents, were sending a message (whether they intended to or not) to the 'true believers' (and there were/are plenty of them) to assassinate him? The cases are analogous in all the relevant respects. If you want to claim that there's a relevant disanalogy, you'll have to try to point it out. A drive-by 'straw man' won't suffice. Here's another line of reasoning: When PETA compares the killing of animals in factory farms to the murder of Jews in concentration camps, is the *obvious* connection that PETA is calling for the killing of farmers? Again, of course not. We may judge their comparison maladroit, but I don't think that any sensible person believes that they're advocating the killing of farmers. Eric, my strawman comment points to your generalized examples (both in the anti-Bush true believers and PETA) in comparison to this Feser guy. This Feser guy keeps the false premise alive that late term abortion doctors are murderers when in reality less than 1% of all abortions are late term and even those demand strict medical documentation there is a real threat to the health of the mother. To compare a murder victim to a serial killer within the same month the man was assinated does skirt the bounds of professional ethics. Now if you want to give a documented rather than hypothetical example I will comment on that. Chuck, you missed the point. None of what you wrote is relevant. The question at issue is whether Feser, in making his comparison between Tiller and Dahmer, was sending a message to the 'true believers' to murder late-term abortionists. If you think he was, then you have to explain why the 'inflammatory rhetoric' used by countless professors against our former president, or why PETA's 'inflammatory rhetoric' against factory farmers, wasn't sending a similar message to the 'true believers' among their respective audiences. chuck, for the tragic circumstances, you seem to say the best option for this traumatized child is to murder her innocent child. Of course, it's not like the only option is to bring the child to full term. She could've had a c-section for a preemie which would probably be safer for the girl, and obviously safer for the baby. The bottom line is the status and significance of the fetus. Is it a person or isn't it? If it is, then killing it is wrong, except in the instance when it's life is in the balance with the mothers because the mother's life is not less important than the infants. But I doubt this line of thinking would qualify many of Tiller's abortions. I understand there was almost always some sort of medical issue, but I don't believe it was always life threatening for the mother. As for the argument of the post, I'm not committed to viewing Tiller on the same level as Dahmer. Ultimately, its not that important. The simple matter is that both did grievous things that should not have been done. No Eric, you missed the point. You are speaking in hypotheticals and not realities. If you read what Feser said, he compared Tiller to Dahmer and admitted that both men should not have been assasinated but, Dahmer deserved to be killed by the State. So, Feser is saying that Tiller deserved the death penalty. He did this in the same month the man was murdered. One must question his intention. Does he look to absolve the murderer by making the victim of the crime the criminal? Does he imply that the death sentence is an appropriate price to pay for one who provides legal medical services? And why does he do this within weeks of a doctor being murdered by one who shares his ideologically perspective? How about you give a specific example that is the equivalent to Feser's comparison. Your current comparisons fall flat. Tell me of a specific PETA apologist who spoke of animal cruelty in comparison to holocaust amidst the crime of genocide. Or, please tell me of a professor who provided a point of view on President Bush's decision making within a time frame where the President had been a victim of an assasination attempt. Rob you said, "Of course, it's not like the only option is to bring the child to full term. She could've had a c-section for a preemie which would probably be safer for the girl, and obviously safer for the baby. The bottom line is the status and significance of the fetus. Is it a person or isn't it? If it is, then killing it is wrong, except in the instance when it's life is in the balance with the mothers because the mother's life is not less important than the infants. But I doubt this line of thinking would qualify many of Tiller's abortions. I understand there was almost always some sort of medical issue, but I don't believe it was always life threatening for the mother." I'd suggeset you read up on the real women whose lives Dr. Tiller saved by performing late term abortions and also the legal constraints already in place which make getting these abortions very difficult. The case that Bill O'Reilly and the Religious Right lay out is full of lies. Dr. Tiller performed a medical service that did not get him rich nor one that was done with malice. He did it because it is a viable scientific procedure that limits human suffering albeit one that has an ugly consequence. The man was murdered by someone who feels justified in the murder because he believes his God was offended by a necessary medical procedure. And Rob, I have to ask. How do you know a nine year old girl could survive a c-section? Are you an OBGYN? Chuck, um, there are numerous 'points' of dispute on any one issue. I clarified the specific point I was discussing, viz. whether it can reasonably be said that Feser was sending a message to others to kill late-term abortionists (as if it wasn't clear from the beginning), yet you insist on raising issues I didn't address. *That's* called missing the point. "Your current comparisons fall flat." Not in any relevant respect -- which is to say, *not in any respect that's relevant to the point I'm making*. Feser said Tiller deserved the death penalty the month he was murdered. The implication is that abortion doctors deserve the death penalty. Yes, to me that is an incitement to further murder. And if we take your examples. If President Bush were to survive an assasination attempt and a professor then said Bush was a war criminal worthy of the death penalty it is reasonable to assume that professor would be brought in for questioning in regards to the attempt. He would also be liable to lose his job based on the ethical policies of his school. So, Feser's attempt to equate Tiller's legal profession with a death-sentenced serial killer within the proximity of the murder indicates he is speaking very clearly on the subject of abortion doctors and their deserved ends. They should be killed. Because of this he does deserve to be fired. On point enough for you. Now can you cite a specific example that is a more appropriate comparison to Feser's recent choices. A professor passionately diagnosing the Supreme Court's 2000 ruling and President Bush's foreign policy do not equate with minimizing the murder of an innocent man by defining him as a criminal worthy of a death sentence. On point enough for you? "Feser said Tiller deserved the death penalty the month he was murdered." Feser: "That the lawful governmental authorities were, because of bad laws and bad court decisions, etc., not doing their job – *which need not require executing Tiller in any case but only imprisoning him* – does not entail that any private individual can usurp their authority." Honestly, you should at least try to get the facts straight before you rant; otherwise, your potentially legitimate criticisms become untenable smears. "Feser said Tiller deserved the *death penalty* the month he was murdered. The implication is that abortion doctors deserve the death penalty. Yes, to me that is an incitement to further *murder*." In other words, abortionists should be given due process and, if found guilty by a jury of their peers, and, if sentenced to death lawfully, killed by the state, therefore individuals should take the law into their own hands and murder abortionists. This is just plain idiotic. Feser compared Tiller to Dahmer and said Tiller was more evil then Dahmer and in setting up his premise said that Dahmer, through his actions deserved to die. I quote, "To be sure, by committing his crimes, Dahmer had forfeited his right to life." The implication by comparison is that Tiller in his actions is MORE deserving to being perceived as having his right to life revoked. If that is not an implication that abortion doctors do not deserve to live, I don't know what is. Help me out here. He didn't say that? Chuck, again, forfeiting one's right to life is only a *necessary* condition for meriting the death penalty; it's not a sufficient condition. If I forfeit my right to life by murdering a child, it's within the power of the state to put me to death. However, the state need not exercise that right: the judge and jury may decide to send me to prison for life instead. There's an important distinction there that you're missing. I'm not going to convince you of my point and do not agree with yours. From my perspective, the argument made by Feser is inflammatory and meant to justify the murder of Tiller due to his perceived "evil" character. You can defend the argument all you want. In your arguments to defend it and parse Feser's words you seem to be defending murder. I guess you're right, I don't understand Feser's point. I'm glad I don't actually. Can you explain his point to me? Chuck, first let me apologize if I've come across as harsh, angry, or whatever. I've read a number of Professor Feser's books, I've read his blog for some time now, and have had some interaction with him on his site. He's always been very helpful and very friendly. In short, he seems to me to be a very competent philosopher and a very good man who has been smeared by a number of people over this issue. Now, I'm not defending Professor Feser because I like him: I said that my liking him explains my anger -- that's all. I'm also not defending him because I'm persuaded that he's right. I'm defending him because I'm persuaded that his views are being grossly misrepresented. And the foremost representation is the issue I was discussing with John, to wit that Feser is somehow endorsing, promoting, advocating or unintentionally 'sending the message' that murdering late-term abortionists is either moral or necessary. *That* is the issue I've been addressing. As far as the 'death penalty' issue goes, I'm not sure just what it is you don't understand. Let me try to explain the point another way: If I don't pay my mortgage, my bank has the right to take my house. In other words, I've forfeited my right to ownership by failing to make my payments. However, the bank need not exercise this right: it can, for a variety of reasons and in a number of ways, choose to work with me. In short, the fact that I've lost the right to my home doesn't entail that I lose my home. It's the same with murder and the death penalty. Also, you have to keep in mind that Professor Feser is arguing that a person who murders others loses his right to life *within the framework of natural law conception of morality*, not within some legalistic framework. In other words, he's arguing that such a person has no moral claim to his life, i.e. no right to life: he's given up that right to the state. However, the state need not react by taking the man's life: e.g. the state may judge the death penalty to be unlawful. In such a case, it will still be the case that *morally* (given a natural law conception of morality) the man will have forfeited his right to life, even if *legally* his life is in no jeopardy. If you don't have the patience to slog through Feser's tortured prose, here is a cartoon that sums up his "argument". Unbeguiled, almost spot on. Almost, because Feser says Tiller forfeited his right to live. It's wosre than the cartoon, especially since this was said by a professor teaching at a state funded college. He should be fired. As already argued here there is no parity with any other scenario mentioned. I guess your arguments work if one believes abortion to be murder. If one doesn't then comparing Dahmer to Tiller doesn't work. I don't think what Tiller did was murder and I do think equating it to serial killing in the midst of a vigilante killing by one who believes it is murder is akin to shouting fire in a crowded theatre. Oh, what a sophisticated comic -- and I don't mean the artwork. Perhaps, if the cartoonist had spent a minute more thinking about the issue than he apparently did drawing the strip -- that is to say, about two minutes total -- he'd have realized how absurd his point is. We were all horrified by Dahmer's crimes; does it follow that we must've been 'happy' when we heard he was murdered? I was overjoyed when Saddam Hussein was captured, but not when he was lawfully executed. If one need not be pleased by the lawful execution of a mass murderer like Hussein, how much more absurd is it to suggest that one must be happy with his unlawful murder (had it occurred)? Chuck said..I do think equating it to serial killing in the midst of a vigilante killing by one who believes it is murder is akin to shouting fire in a crowded theatre. Now THAT is spot on! I was happy when Dahmer died. He was a monster. I was happy when Hussein was executed. He was a monster. I was saddened when Dr. Tiller was murdered. He provided safe medical care to women at risk who needed it. I was angered when self-righteous people compared him to a serial killer. I was appalled when these people didn't have the moral courage to recognize their rhetoric has real implications. What people find offensive about your argument and defense of Feser is the easy moral equivalence you place on Dr. Tiller and real monsters. It operates from a premise we don't embrace. Necessary and tragic abortions are not serial killings and to suggest them as such is where people see malice and see the seeds of violence. "As already argued here there is no parity with any other scenario mentioned." The PETA example fits perfectly. PETA has compared factory farming with Nazi concentration camps. It has compared the killing of animals in such farms to the mass murder of Jews. PETA is known to attract some rather unhinged people. By comparing factory farmers to Nazis, PETA must -- by parity of reasoning -- be endorsing, condoning, promoting, advocating or 'sending the message' that murdering factory farmers is as morally justifiable as killing concentration camp officers and guards. After all, what would YOU do if the moral equivalent of the Holocaust were taking place daily in your backyard, with the full consent of the state? The example fits almost perfectly, yet no one in his right mind thinks that PETA is advocating or 'sending the message' that people are morally justified in killing factory farmers. Similarly, no one in his right mind could conclude that Feser is promoting or condoning the murder of late-term abortionists. "What people find offensive about your argument and defense of Feser is the easy moral equivalence you place on Dr. Tiller and real monsters. It operates from a premise we don't embrace." Chuck, that's not a premise of the argument I'm making. In fact, I could completely disagree with Feser about this issue *and still*, with *perfect consistency* make the argument I'm presenting here. I don't have to agree with Feser that Dahmer and Tiller were similarly evil to argue that Feser is not, *in any sense whatsoever*, advocating the murder of people like Tiller. Like I've said before. You and I will not agree. You supposition that Dr. Tiller forfeited his right to live is where your argument breaks down. Fine, you don't think Feser should be fired. If he worked at my place of employment and said what he said, he probably would be. I do believe PETA looks to encourage domestic terrorism with their stance and their words. I think they are a ridiculous organization that has faulty ethical reasoning. I think their arguments encourage the kind of destruction you see when activists raid factory farms. "You supposition that Dr. Tiller forfeited his right to live is where your argument breaks down." Again, that's not part of my argument; it's part of Professor Feser's argument. I could disagree entirely with him here and still consistently argue that Professor Feser is not advocating or condoning the murder of late-term abortionists. Let me make this crystal clear: I'm only arguing that the claim that Feser is in any sense advocating or condoning the murder of late-term abortionists is patently absurd. I can agree with you entirely about the abortion issue *and still* consistently argue that Feser is not advocating or condoning the murder of late-term abortionists (something which Professor Feser's liberal colleague at Pasadena, Hugo Schwyzer, has conceded). The case that Bill O'Reilly and the Religious Right lay out is full of lies. So those you disagree with are liars and those you agree with are the reliable ones. sounds like insulation to me. Fact is, you can't really read up on most of Tiller's patients anyhow because of HIPPA. I did a brief scan of wikipedia and it didn't indicate that they were frequently life saving procedures, but it seemed the wikipedian of the moment and/or the dominant opinion was a sympathetic one that said that most (or all) of his patients were of fetus with a severe or fatal birth defect or of women who'd have risk of "substantial and irreversible impairment of a major bodily function." Life of the mother wasn't mentioned. Also the statement was headed with "reportedly". According to Tiller's own spokesperson, (reported by NRTL) 3/4 of Tiller's abortion patients were teenage girls. Now for so many women near the ideal age of giving birth, I doubt all of his buisness represented the worst of complications which are rare in our medically sophisticated age. Life of mother issues are even more rare. I could if you want me to. Of course I have immediate access to general practitioners. I suggest you educate yourself on the law and the legal restrictions accompanying the practice of late term abortions. There are pretty strict criteria that must be met before the procedure can be done. One doesn't need to know the exact cases to understand the limits the law establishes. But your side doesn't want limited abortion based on legitimate medical need. Your side wants prohibition. If that were the case then the 9 year old girl I cited would have died an awful bloody death. What a loving God you worship who would allow a 9 year old to be raped by her step-father and then explode so that life could be brought into this world. I will take it by your response that you are not an OBGYN and therefore do not have the authority to speak of alternate medical procedures. Thanks. Okay Eric. Doctor Feser is not condoning the murder of late term abortion doctors. He is demonizing an innocent murder victim however. I'd fire him if he worked for me. Abortion does not equal murder. Murder is a legal term. We kill people all of the time. The Bible calls for the killing of people and even genocide where it's even hoped that babies are even dashed upon the rocks, and that means the parents are already dead so the soldiers have the freedom to go around doing this. What one country considers to be murder varies from country to country and era to era. There are also degrees of murder, from 1st-2nd-3rd degree, to vehicular homicide, to manslaughter. When it comes to these crimes there are mitigating circumstances calling for vastly different punishments from the death penalty to 25 to life, to 5 years of probation. The “Eye For An Eye” "lex talionis" Passages (Leviticus 24:18-20; Exodus 21:22-25) cannot apply to abortion since the related incident is about an accidental injury and not an intentional abortion. The law does not require the death penalty for an accidental death (Ex. 21:13-14, 20-21; Numb. 35:10-34; Deut. 19:1-13). The concern expressed is for the husband’s loss of property, both his wife and his child to be. If anti-abortionists want to use this text then let them also embrace the property status of the woman to her husband. and let them also embrace a barbaric “eye for an eye” justice. Such texts comes from a superstitious and barbaric people requiring us to ignore them. After all, upon reading through Judges 19-21 what ethical right do these people have to tell us how to live our lives. Read it. Even if it's merely telling us what happened without an ethical judgement, which it is, what legitimate right does a barbaric people like that have in writing down ethical principles for us to live by? NONE. We must decide for ourselves. So did Tiller. He did not forfeit his life because he operated under the law and helped people. In the spirit of "Christian Charity" here is a web site with some facts about late-term abortions and the laws governing them. It indicates why I think Bill O'Reilly and the Religious Right are liars. It has nothing to do with insularity but everything to do with observed fact. In regards to late term abortions, it's the responsibility of BOTH sides to create legislation that will actually get voted into law. However, as Chuck noted, the Christian right is clearly not looking for a compromise. Demanding prohibition or adding wording which is obviously designed to create in-roads for prohibition is a sure fire way to ensure such legislation will NOT be passed. The responsibility rests firmly on both sides. Damn I love that song though. Cowardly reason not to read the book, I'm afraid. I wonder what abortionist providers (and their families) might feel like after Feser's post saying they have lost their moral right to life when there are idiots out there who will draw a different conclusion by rejecting the second half of his argument against vigilantism. Let me give one final analogy: How alarmed would Feser be in an atheist dominated society if a respected voice argued forcefully that Christian professors who teach their delusions have lost their right to life, and compared them to what Dahmer had done? Seriously consider this question and you'll see my point. "Let me give one final analogy: How alarmed would Feser be in an atheist dominated society if a respected voice argued forcefully that Christian professors who teach their delusions have lost their right to life, and compared them to what Dahmer had done? Seriously consider this question and you'll see my point." John, I'm shocked by this analogy. You studied at a Catholic University, so I think it's safe to assume that you know at least something about Natural Law morality. Now, given an NL framework, one who takes the life another human being without adequate justification forfeits his own right to life. It is certainly not unreasonable to claim that late-term abortions involve taking the life of another human being, and it is not unreasonable to suppose that this killing is in some cases unjustified. However, what in the world is the analogous offense in your example? How in the world could you justify, given any remotely plausible moral theory, the notion that one forfeits his right to life by teaching one's religion? I'm glad you have brought him to my attention. I can avoid anything he writes now because I know how he thinks.